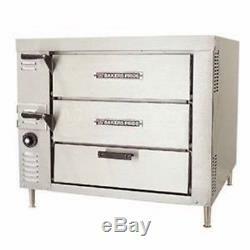 From Bakers Pride Restaurant Equipment - Oven, countertop, gas, pizza/bake, single compartment two 21"W x 26-1/4"D x 5"H ceramic decks, center deck removable, thermostat 650°F, s/s exterior, 4" legs with adjustable feet, 40,000 BTU - Your Source for Quality Restaurant Equipment and Supplies. The item "Bakers Pride HearthBake GP-51 Single Counter Top Pizza and Baking Gas Oven, 32 5" is in sale since Wednesday, February 22, 2017. This item is in the category "Business & Industrial\Restaurant & Food Service\Commercial Kitchen Equipment\Cooking & Warming Equipment\Ovens & Ranges\Pizza Ovens". The seller is "restauranttory" and is located in Pottstown, Pennsylvania. This item can be shipped worldwide.